This week's Thematic theme, please be seated, is a rather personal one because I tend to spend more time than I should sitting on chairs. Call it a writer's occupational hazard. Thankfully I don't have to spend much time in chairs like the one you see here. It was parent-teacher interview night at our kids' school, and as I waited for the final appointment of the night, I found myself facing this rather forlorn-looking scene. It struck me as dimensionally perfect, so plain yet so richly full of detail about what it felt like to be Right There. Indeed, at various times in our lives we've all been seated out in the hall on an uncomfortable chair, institutional linoleum at our feet, institutional concrete block around us, and institutional fluorescent lights and pock-marked drop-ceilings above us. Within that context, this may be one of the most relatable pics I've shared in a while. At least that's what I hope the principal was thinking when she busted me. 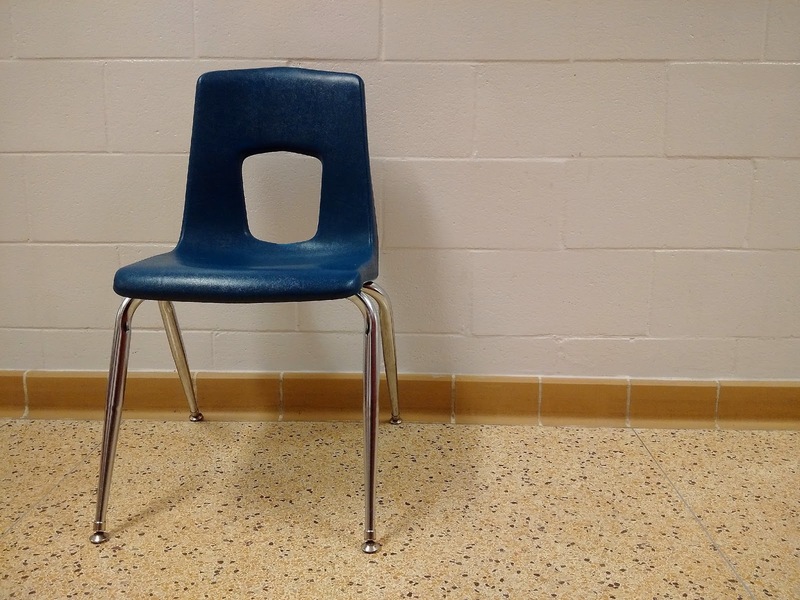 Your turn: Take a photo that evokes, suggests or merely breathes the name of this week's please be seated theme. Post it to your blog or website, then leave a comment here letting everyone know where to find it. Already got something online? Share that, too! Head here for more background on Thematic. Visit other participants and come back through the week - we encourage serial sharing. And friends. Because photography is more fun when it's shared. Yes! Nothing quite as uncomfortable as a parent interview chair, or a school hall chair! Here's what this theme made me think about. Here's an unusual (and beautiful) chair for your collection. It may not be very comfortable to sit in, though. I have stacked (and unstacked) hundreds of chairs like yours.